Being such a complete storehouse of wellness and beauty, almonds need to be tapped into in the right way to extract maximum benefit out of it. There is an enzyme inhibitor present in the skin of the almonds which stops the release of absorbable nutrients in the nuts as well as making it difficult to digest. Thus, we need to soak it in order to enable easy peeling off of the outer skin. Improves Digestion– As stated earlier, on soaking the almond in water, the enzyme inhibitor gets released which helps in better nutrient availability and absorption. In water, almonds release the enzyme lipase which helps in the digestion of fats. Weight Loss– Almonds being rich sources of Vitamin E, help in lowering bad cholesterol which is directly responsible for helping in weight loss. Another beneficial effect of taking in soaked almonds is that these nuts prevent one from over-eating because of the presence of monounsaturates in almonds which curbs appetite, thus reducing weight. Read our post on “How to Lose Weight Using Cinnamon Powder and Honey” here. Prevents Cardiovascular Diseases– Soaking almonds help in increasing the High-density lipoproteins (HDL) and reduces the levels of Low-density lipoproteins (LDL). Maintaining this ratio of HDL: LDL is important for the heart. Vitamin E present in almonds prevents the risk of generating heart ailments. Magnesium in almonds has the property of averting heart attacks. Folic acid in these nuts helps prevent blockage of arteries. Cancer prevention-Prostrate and breast cancer can be avoided by eating soaked almonds. They contain flavonoids and Vitamin E which prevent these cancers from occurring. This increases the life expectancy by lowering the incidence of cancer. Soaked almonds contain Vitamin B17 which is important in fighting against cancer. Controls Diabetes and Blood Pressure– Soaked almonds when consumed with a low calorie diet, lowers the level of blood sugar, insulin and sodium and heightens the levels of magnesium which is responsible for controlling the incidence of diabetes and blood pressure. Protection during Pregnancy– Folic acid present in almonds reduces chances of birth defects in newborns greatly. Thus, a pregnant woman is advised to consume soaked almonds. Memory Improvement-One of the memory boosters that are known to man, almonds are rich in fats which help in improving intelligence and memory levels. For enhanced memory, it is advisable to consume 4-6 soaked almonds every morning. 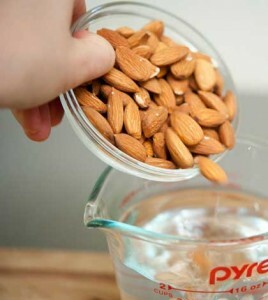 Soak almonds overnight in water and boil them in the morning. It acts as an effective moisturiser for dry skin when blended with whipped cream and used. Most of the beauty products these days use almonds lavishly –be it as a face scrub or a peel-off mask. Almonds have become the bedside beauty ingredient with absolutely no ill or side effects. If one suffers from chapped lips, they can apply a paste of soaked almonds to make it soft and supple. Not only will this improve the texture of the lips but also restore its natural colour which otherwise gets affected by the frequent use of cosmetics. Almond oil when applied to the hair gives it a healthy sheen and makes it bouncy. Consuming almonds is a healthy practice but it should be done in the right way. It should always be taken after soaking it overnight in water, removing the outer peel and then eating it. Eat almonds daily in the right way to extract maximum benefits out of it. Go nuts over these nuts!